At my mouth like it’s an opening in your chest. Look. Look as I cut my own body that is you. Object into its own burrowing and boiling self. Especially when heartless, these, my vein visions. 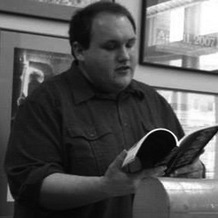 Aaron Apps is a PhD student in English Literature at Brown University. He is the author of Intersex (Tarpaulin Sky Press, 2014 [forthcoming]), and Compos(t) Mentis (BlazeVOX, 2012). His poetry and nonfiction has appeared in numerous journals, including Pleiades, LIT, Washington Square Review, Puerto del Sol, Los Angeles Review, and Carolina Quarterly.